All Harmony evolution products bear a six month unconditional, 100% money back satisfaction guarantee. Further, all Harmony evolution products are guaranteed to function for at least ten years. 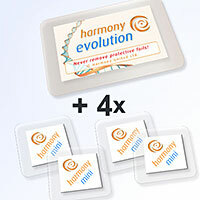 In this offer you can purchase 4 Harmony Mini Chips in combination with your purchase of a Harmony Evolution at a discount. Normal price would be £353.50.